My dad loves to fish. I think he’d rather sit in a boat with a line in the water rather than do anything else in the world. When father’s day or a birthday or Christmas roll around for him, picking up something fishing-related for him is always a surefire winner. This year, I watercolored a few fish and made them into 4×6 prints just for dads, and am sharing them with you, along with how I stained plain frames to look like aged wood! Best part? 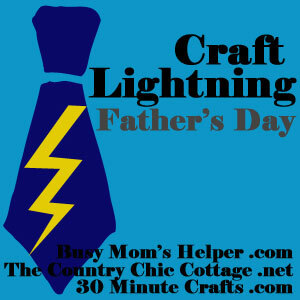 These are Craft Lightning projects, so you can have them done in less than 10 minutes! Here is the why of using brochure paper for printables, if you’re interested in reading up! I used the stains I happened to have in my cabinet for these frames, so you might want to experiment a little to see what works for you. I would definitely go with a grey stain and a reddish stain for the aging process when you are making your choices. There are two sayings on the free printable sign, one is “Our dad is reely awesome!”, the other is “Dad, you are really awesome!” so if you’re one person gifting this print, you’re covered, too. Couple of affiliate links below–they cost you nothing, but help keep this site running! Super easy. I took a soft cloth, dipped it in a little bit of the grey stain, then covered the frame (all sides!). While the stain is still wet, wipe off as much excess stain as you can. You don’t have to wait until the stain is dry to put on the second color of stain. With your cloth colored index finger, lightly dip the cloth in stain, then draw horizontal lines across the face of the frame randomly. After you draw on your lines, blend them in by wiping with a clean cloth. From there, all you have to do is print out your fish print and pop it into your frame! Easy peasy, and a great looking gift for father’s day! Love love love this! Thanks for joining! I love this technique for aging wood. The gifts are also cute . Any father would be happy to receive a gift this nice. Wow, when I first looked at the finished product at the beginning, I hadn’t realized the wood looked brand new beforehand. It definitely looks a lot better with the aged looked, and I’m sure my dad would love this! Thanks for sharing. These frames are pretty affordable and the technique to simple. Beyond Father’s Day I can think of lots of uses, thank you!